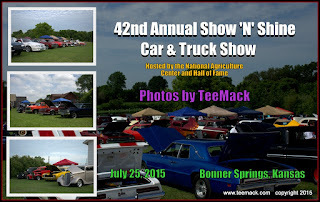 The 42nd Annual Show N Shine Car and Truck Show was hosted by the National Agriculture Center and Hall of Fame in Bonner Springs, Kansas on July 25, 2015. The Annual event is the longest running Annual Car Show in the Kansas City area. This year approximately 120 vehicles attended the Show. Those who attended could ride the antique miniature train and enjoy the scenic background of a historical farm town. Food was provide by the VFW. With a slight breeze and temperatures in the 90's, everyone seem to have a great time. Click here to view photos of the Show 'N' Shine Car and Truck Show.